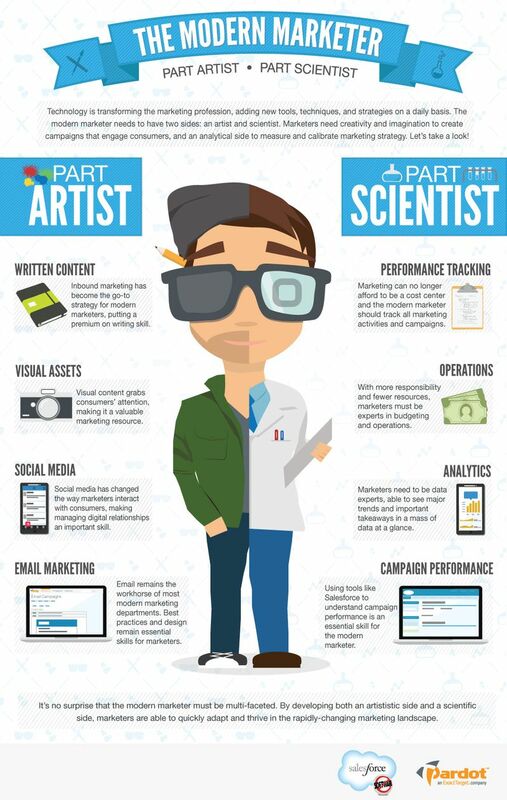 Is It A Stretch To Say The Modern Marketer Is Part Scientist And Part Artist? Clearly technology has transformed the marketing profession and will continue to do so as wireless digital communications continue to evolve. Marketers need to have an ever expanding imagination in order to keep up with consumers demands for entertainment. Consumer engagement is a central theme to every successful campaign in the modern era of mobile devices. Price conscious and internet savvy, the consumer is stimulated by massive amounts of multimedia presentations all telling them this is what they want, need and desire. The younger members of the family have greater influence on buying decisions than ever before. The marketer needs to be able to wear multiple hats; as a resurgence of the age old concept of the Renaissance man is a modern day reality. New technologies for studying trends and statistics are being added at sub light speeds. Bringing with them a need to generate new techniques and strategies, its not just about the number and placement of key words any more. The modern marketer must absorb new programs and platforms on which to create and operate while delivering gallery quality graphic art to their audiences. The author and journalistic writer must take a look at the written content within each faction of an emerging ad campaign. The photographer and visual artist must study every aspect of each and every visual image placed in front of the consumer. The social media expert must be able to engage their audiences with what is current and trending and email dialogue must also keep up with the times. In most advertising companies today this is often one person or several people with equal qualifications sharing ideas. The email remains the workhorse of every modern marketing department. Making sure best practices and innovative design is deployed are core requirements for both rookie and seasoned marketers. Social connections are as important to make as business connections when it comes to strategy. On the other side of the coin, we have the marketing research scientist who must be able to track the campaign performance on multiple platforms and devices. The ad can no longer just be a cost center today’s enthusiastic entrepreneurs, big retailers and manufactures demand to know how their ad investments are performing. The growing access to free information has kept the staff every multimedia marketing firm on their toes. Additionally with more advertisers entering the market, each individual operation needs to be financially conscious and budget their resources accordingly. Marketers need to have the ability to identify important trends within massive amounts of data at a glance. It is no surprise that marketing and add men need to be multifaceted. Using tools like salesforce will continue to be an integral part of establishing and tracking the modern ad campaign.